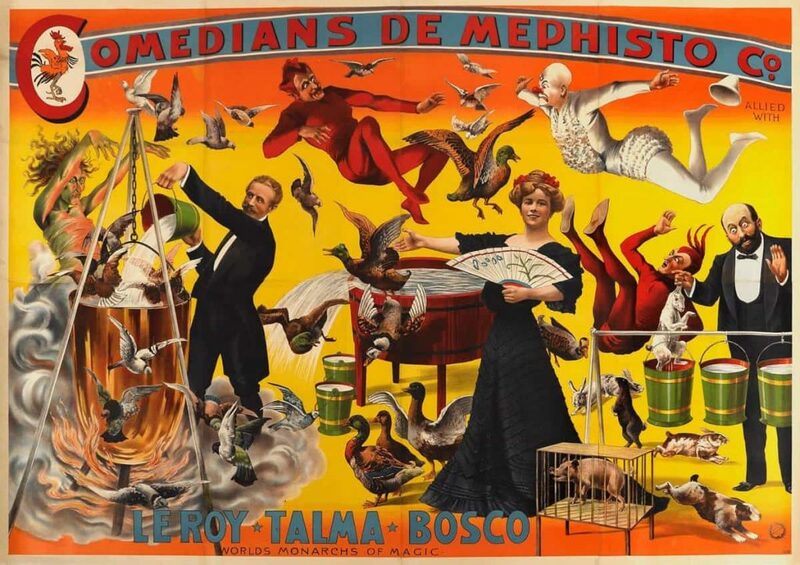 Poster for the “Comedians de Mephisto Co.” (1905). The colourful posters of 19th and 20th century stage magicians demonstrate clearly many of the ideas about “magic” which the modern West inherited from Graeco-Roman and Judaeo-Christian discourses – magic as wondrous, diabolical, foreign, exotic, and illusory. In our first blog post, we tried to briefly describe what we meant by “Coptic magical papyri”, a simple phrase which contains hidden complexities. We recently received a message from one of our readers, who, while supportive, questioned the usefulness of the word “magic” in the study of the ancient Mediterranean. Since we share many of her concerns, we decided that it might be useful to discuss the term “magic” in more detail, and explain why we have decided to use it, despite our misgivings. This post will not discuss in detail the terms for “magic” in late antique Egypt, or modern theories of magic; we’re saving those topics for later discussions. Our reader’s question raised several important points. Firstly, she pointed out that “magic” is often used as a term to denigrate other religions, or aspects of them. She points out that for the Greek and Roman elites, “magic” (mag(e)ia) often referred to practices which were thought of as belonging to foreign ‘barbarians’, while, for Christians, “magic” was used to refer to practices which were seen as “un-Christian”. The use of the frame of “magic” can also change the terms of the discussion; as our reader put it, “prayers automatically become ‘spells’ and ‘incantations’”. Yet, as she also points out, the language used in both “prayers” and “spells” for a given culture is often very similar. Does the contextual difference in the spoken formulas used in “day-to-day practices and sacrifices” (“prayers”) and in cursing (“spells”) justify this different vocabulary? Poster for the 1898 performance of Catulle Mendès’ Medea with Sarah Bernhardt in the leading role, by Alphonse Mucha. Medea was, and remains, one of the most (in)famous magic-users of Greek myth. These are all good points, and ones that scholars have often, and sometimes continue to, forget. Articles on ancient Mediterranean magic from the 19th, and much of the 20th century often seem to have a very naïve view of what they call magic. As soon as something is labelled magic, the word brings with it all the associations built up over centuries of classical and Christian discourse – “magic” as a secretive, illogical, fraudulent and subversive practice which can be clearly differentiated from “religion” . This changed in the 1990s, in particular with an article by Hendrik Versnel entitled “Reflections on the Relationship Magic-Religion” (1991), which drew upon work that was already very old in anthropology to point out that neither “magic” nor “religion” existed as objects in themselves, but were concepts used by scholars, which often contained value judgements. Following Versnel’s articulation of the problem, scholarly work on ancient magic in the last 30 or so years has spent considerable time grappling with the term “magic”, trying to decide whether to abandon it or to continue using it, and if it is to be used, how. One approach was that of Marvin Meyer, whose Coptic Magical Texts project produced the best-known collection of Coptic magical texts, Ancient Christian Magic (1999). Meyer preferred the term “ritual power”, since for him it described the way in which “magical” texts used “ritual” to access supernatural “power”. Some scholars have adopted this terminology, referring to “texts of ritual power” rather than “magical texts”. So why isn’t this project called “Coptic Texts of Ritual Power”? The problem for us is that “ritual power”, taken seriously, must take in a different, and indeed, much larger body of material than that traditionally considered “magical”. All of the ritual texts of the orthodox Christian Church – not only prayers, but also baptismal, eucharistic, funerary, marriage, and other rituals – must be understood as using “ritual power” just as much as “magical” texts, and there are surely many other “rituals” involving “power” that might also fall into that category – the appointment of magistrates, the swearing of oaths, the signing of contracts, and so on. By contrast, the wearing of amulets with copies of Biblical texts is not necessarily a “ritual” process – the texts might be copied like any other text, and worn like any other piece of clothing or ornament; their amuletic power came not from “ritual”, but from some power, or performative agency, inherent in the written text itself. A study of ritual power, therefore, would really be a study of some “magical” and liturgical texts, alongside many other practices, but would either exclude interesting comparanda from non-ritual spheres, or risk misusing the word “ritual” to mean something like “magic”. While a study of all ritual practices in late antique Egypt would be highly desirable, we have chosen to focus on a smaller category of texts which constitute a feasible corpus for a five-year study. As we have discussed, this category demonstrates a cluster of shared formal and functional features, often different from other classes of ritual texts, and has traditionally been called “magical”. This does not mean that we plan to study them in isolation. As we hope we have shown in our posts so far, we consider their physical and social context crucial to understanding them. Much of our planned work involves looking at their relationship with other categories of ritual texts (such as orthodox practices of exorcism and the anointing of the sick), without assuming any meaningful differences at the outset just because of the different terms we use for them. 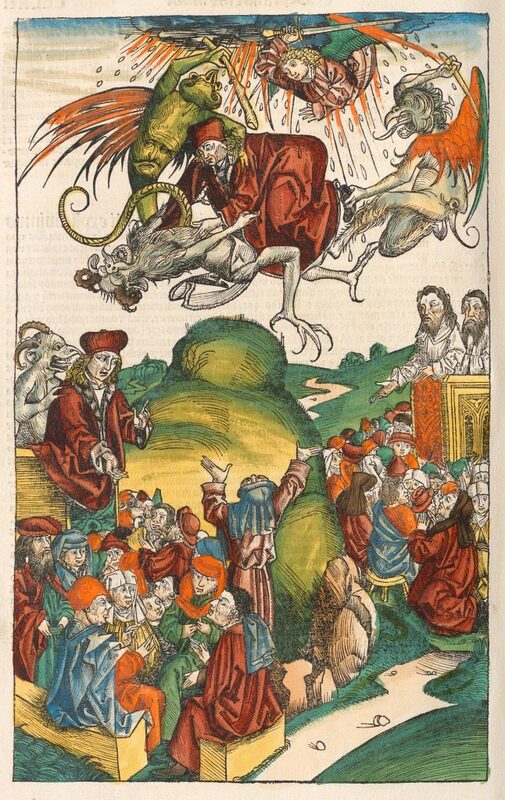 An illustration from the Nuremberg Chronicle (1493) of the Antichrist about to fall to his death, having been carried into the air by demons. This imagery is based on the fate of Simon Magus, who attempted to use magic to levitate in the apocryphal Acts of Peter, but was thwarted by the prayers of the eponymous apostle. A second approach to the problem of the term “magic” is to use an ancient emic term, that is, one used by the society we are studying itself. The term mageia, the ancestor of our “magic”, is often chosen for this purpose, since it was used in both Greek and Coptic. Discussions of mageia are found in many texts from the period we are studying, but we do not think it offers a clear solution to the terminological problem. The view of mageia in Christian literary texts is almost entirely negative, filled with stereotypes of devil-worshipping, fraudulent magicians who are defeated in contests with saints. While it seems that the authors of these texts are at times describing practices similar to those in the magical texts, we think it is necessary to distinguish this “magic as discourse” from “magic as practice” – two separate objects of study, which nonetheless have a complex and interesting relationship. As we saw last week, “magical texts” from Christian Egypt very often discuss mageia, not as their own practices, but as a negative force from which they offer protection. This suggests that they did not necessarily identify their own practices as mageia, so that a study of mageia would be yet another different study, of a social discourse, rather than of the “magical” texts. Again, this is something that we will study as part of our project, but not as the main focus. Part of the problem comes down to the inherent imperfection of language; all of the terms that we use as scholars – magic, religion, ritual, Christian, economy, state, and so on – can, should, and usually have been deconstructed, so that their limitations can be exposed. But, unlike the users of “magical” texts, we do not have access to a perfect divine language, and so any new terminology will bring with it new problems – the often unacknowledged larger sphere of “ritual power” or the narrower and more culturally-specific meaning of mageia. In some ways these terms can be more misleading than “magic”, since they have been subject to less scrutiny, and may suggest to unwary readers that they perfectly describe clear phenomena. “Magic”, with its many problems, is multivalent, and has been very well deconstructed, so that we hope that by using it in a minimal sense, to describe a body of texts for which we have no other suitable name, we can offer readers a reasonably clear first-order description. We will aim to be careful in our discussions not to assume relationships with other material designated as “magical” without demonstration, or to ignore the way in which “magical” texts are intertwined with other aspects of social life in late antique Egypt. As we work more on this material, we may find that we develop better terminology, but for now, the word “magic” is an imperfect tool which we hope can nonetheless be put to good use. …in 1992, as he convened one of the first of what would be many conferences on ancient Mediterranean magic, Marvin Meyer charged the participants with a task that he compared to reaching a river by means of a rickety bicycle. Scholars, he suggested, had spent so much time trying to repair their definitions of magic (the bicycle) that they had failed to make any progress toward studying phenomena that might be categorized under that term (the river). He urged us to stop tinkering and start riding, even if we had to pause now and then to tighten the chain or replace a spoke (that is, fine-tune the definition). Sarah Iles Johnston, “Describing the Undefinable” , p.50. * We have anonymised our reader, a scholar of religion in her own right, out of respect, but will add her name if she so requests. Gnosticism, like magic, is a term whose use has been considerably debated and deconstructed by scholars over the last hundred years. This article offers an excellent overview of these debates, and offers a useful parallel to this discussion of using the term “magic”. A good overview of the literary evidence for “magic” in the ancient Mediterranean; pages 14–17 in particular contain a helpful discussion of the Greek and Latin terminology, including the term mag(e)ia. A review of three then-recent books on ancient magic, offering a useful state-of-the-art overview, and containing the anecdote about Marvin Meyer cited above. An article on the status of “magic” in Pharaonic Egypt, offering a useful parallel to discussions of magic in the Graeco-Roman world. Sanzo, Joseph E. “Deconstructing the Deconstructionists: A Response to Recent Criticisms of the Rubric ‘Ancient Magic.’” In Ancient Magic: Then and Now, edited by Attilio Mastrocinque, Joseph E. Sanzo, and Marianna Scapini (forthcoming). While we were preparing this post, we came across a reference this forthcoming article, which Dr. Sanzo kindly shared with us. Our conclusions about the term “magic” are very similar to his, and so this article offers a more fully-argued and referenced parallel to the argument advanced here. One of the many thought-provoking articles produced by the late historian of religion Jonathan Z. Smith during the debates on the use of the term “magic” in the 1990s and early 2000s. The article mentioned in this blog post as representing a of the key moments in the study of ancient Mediterranean magic – one of the first discussions to articulate the problems inherent in the term “magic”.